All food provided at Montessori International Preschool for meals and snacks is included in the tuition fee. 8:30 to 11:10 – Morning snack – the children can eat fruit, crackers or bread during this time if they are hungry. They cut their fruit on their own and press their own orange juice too! They eat at the snack table and once they are finished, they do the dishes and tidy up so that it is ready for the next children to have snack. 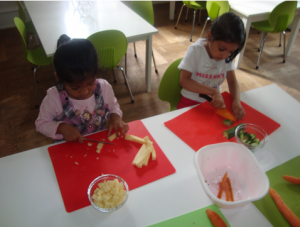 10:00 to 11:00 – Food preparation – the children help with food preparation. They help to clean the vegetables, peel them and cut them up as well as grate cheese, make bread and help out with other easy tasks dependent on the menu of the day. We usually eat for lunch (and afternoon) what we prepared in the morning. 12:00 – Lunchtime – We serve hot meals based on a vegetarian diet, made with organic ingredients, as much as possible. 14:30 – 15:30 – Afternoon snack – We finish leftover vegetables from lunchtime, have more fruit and anything else that we prepared in the morning. 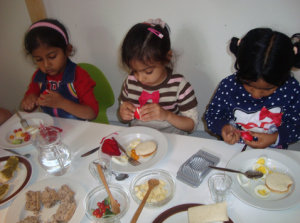 We believe that a healthy diet is essential to children’s wellbeing and ability to learn. We foster an environment of healthy eating and an interest in good, fresh food. Cooking activities and monthly topics encourage children to explore food from its source to the plate. 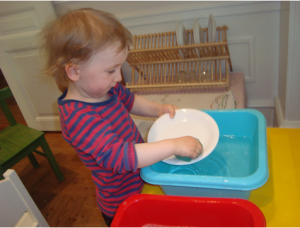 We provide a perfectly balanced menu which gives your child the best possible chance to thrive and flourish. We cook and prepare everything in our own kitchen. This ensures we know exactly what is in the food, and helps us make sure any allergies are avoided. We also try to use seasonally available fruit and vegetables. These tend to be available from local sources, so are fresher, tastier and travel less – all making our menu more nutritional and helping us to do our bit for sustainability too. We try to introduce a wide-variety of ingredients and flavours to the children at school, so that they can grow up being healthy and feeling positive about trying new foods. 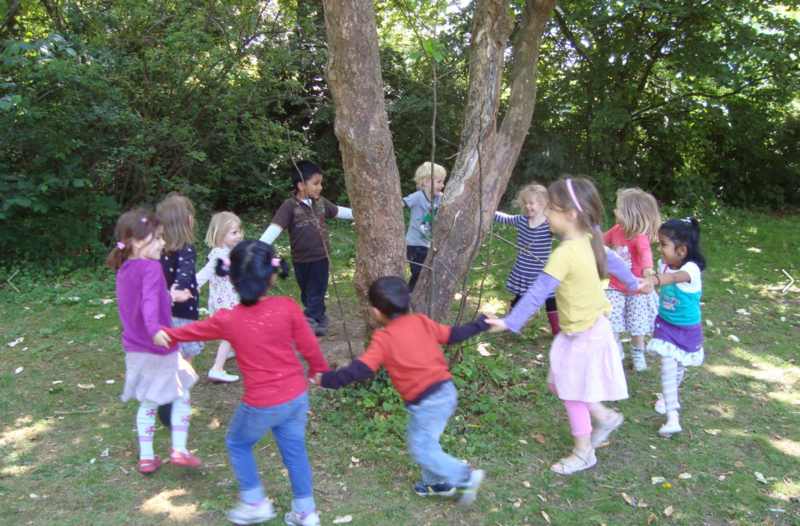 We also believe it is important to develop the child’s social skills. Mealtimes are very important in this respect. The children lay and clear the tables. They serve themselves and then sit together to enjoy the pleasure of the meal, which becomes an educational and social occasion promoting good manners. Finally, they clear the tables and help clean up, promoting responsibility for the entire meal time.